Quite possibly the best downriver paddleboard on the market. Scout your line and stick it, the Lochsa will help take you there. This is “THE” downriver Whitewater board. Our design teams combined 40 years of whitewater kayaking shows up in every aspect of this board. From the rails, to the rocker. 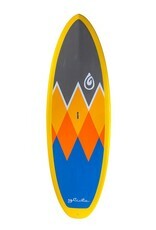 This board is made to get you down river safely and standing with a big smile on your face.